April 29 at 6:30 in the Dr. AR Lord Elementary Library. A facilitator will lead this session on child anxiety in a workshop setting that will be interactive. We are co-hosting this session with Franklin Elementary PAC. Please RSVP as soon as possible. If we do not have 25 participants we will have to cancel the event. We have some fun events coming up as we approach the end of the school year and 2 months off of school. The kids really enjoy these events, and what makes them come together are volunteers to pull this off. We're hoping for 15 volunteers for Sports day and about 10 for the year end BBQ. We require baking, raffles, serving food and other duties as required. Lets finish this year off great! 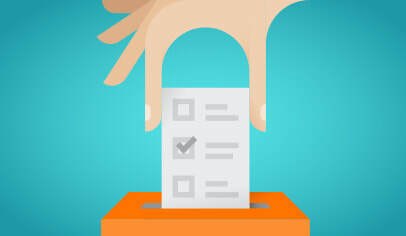 On our May 15th PAC meeting the members were asked to nominate and vote on the PAC Exec that would be administering the PAC activities throughout the 2018/19 school year. First, though, we'd like to thank the continued support of our departing PAC Exec members. Their dedication and support are what has helped the PAC have a successful year. Our first meeting of 2018/19 school year we will open up the floor for any other parents that would like to join the PAC. The plans are coming together for this fun neighbourhood outing. The ride will start around 4:00. One, two, four, ten wheels....it doesn't matter - just come out for the fun, get moving through out Neighbourhood ride. We will have hotdogs and drinks after to refuel all the riders. And if the weather is nice bring your bathing suits to cool off in the spray park. We want to thank the PNE for helping to sponsor this fantastic day. 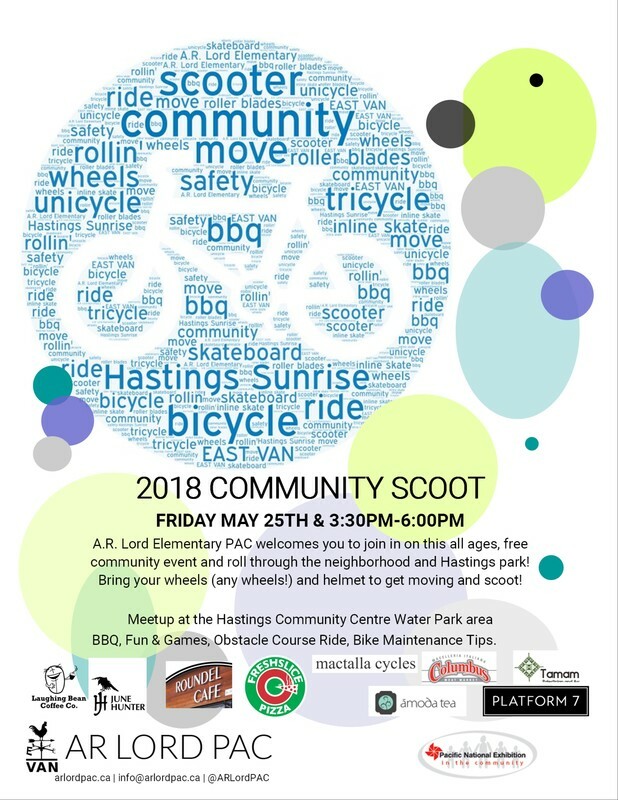 Bring your wheels (scooter bicycle, stroller roller blades, skateboard, unicycle, tricycle) and join in on a short all ages community scoot around the neighbourhood. This PAC coordinated event will include a Hot Dog BBQ, cotton candy, road safety tips, bike maintenance, and fun and games! All for Free! The Laughing Bean Coffee Co.
We have a couple events coming up that need volunteers. Earth day will be a celebration that plans on connecting with an indigenous garden and trips outside during the afternoon. Parent participation is requested to make this a success. We are proud to be offered a spot at the next Farmers market. Hoping for good weather. We're looking for parents who will staff the Tote and t-shirt sales table throughout the day to make this a success. Fundraising from totes and shirts support the school's Athletic uniforms and sporting equipment. The tragic accident involving the Humboldt Broncos team and the loss of so many lives is difficult to comprehend and accept. Every Canadian, regardless of where they live, feels a sense of sadness, loss and sympathy for the players, coaches, families and communities directly impacted by this terrible accident. April 12th Jersey Day: A group of hockey parents from Langley are encouraging others to wear sports jerseys on April 12th as a gesture to let families directly impacted know that they are not alone. Some Vancouver schools are participating but individual families should decide whether they would like their child/children to participate in this event. The park board is meeting Dec 11th to make a decision on the proposed demolition of templeton pool from the vansplash survey results. ​Please spread it out there far and wide. We need the commissioners to hear that this little pool is a special part of our community. Thanks for you anticipated support. UBC Girlsmarts, a non-profit organization launched by the UBC Computer Science department to help girls spark and sustain an interest in computer science. Our organization has been running workshops since 2004 and we often partner up with various local tech companies (including Microsoft, Amazon, SAP, and many others) to run many different workshops and activities for girls in grades 6 to 12. We were wondering if you would be interested in learning more about our workshops and possibly letting parents on your mailing list know about workshops we are offering. We will have workshops for grade 6 girls (in partnership with Microsoft) and grade 7 girls (in partnership with SAP). Our grade 6 workshops will be held at UBC on Saturday, January 20, 2018 and Saturday, February 3, 2018 and will teach girls about programming their own game, cybersecurity, creating their own webpage, and hardware. The next grade 7 workshop will be held on Saturday, February 17, 2018 at SAP Vancouver (in Yaletown) and will teach girls about design thinking, programming, and designing a user interface. We are also offering technical and business mentors to help them participate in Technovation, a global competition to create an app to solve a problem in their community. Mentors will be sourced from industry professionals at Tasktop Technologies, a local tech company, and UBC undergraduate students. This will mark the second year that UBC CS and Tasktop are working together to mentor girls for Technovation. Last year we had a very successful initial participation in this challenge with two of the teams winning their category - one of which won $5000 after attending the finals!